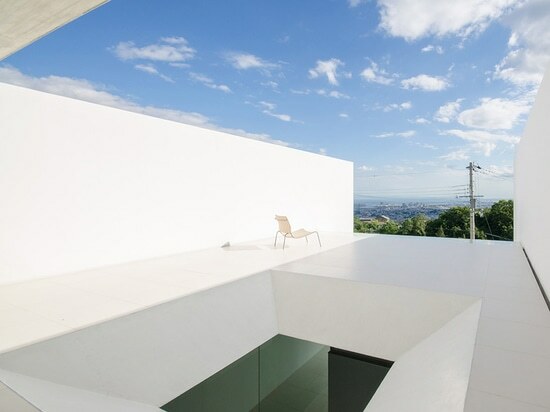 Six slabs of wafer-thin concrete form the floors and walls of this house by Kubota Architect Atelier, which cuts into the side of a mountain in Japan's Hyogo Prefecture. Three of YA-House's four floors step back into the slope of the mountain and are sandwiched between two vertical planes of concrete, while the uppermost level is fully exposed and sheathed in glass. The first three levels run perpendicular to the road, while the glazed fourth floor is positioned in parallel, offering residents views of the city below from their main living space. 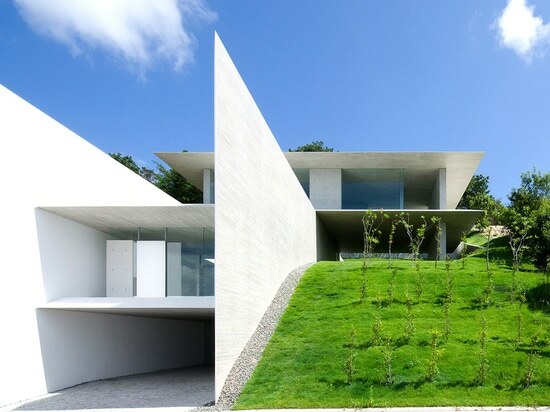 Kubota Architect Atelier tapered the edges of the exposed concrete slabs to exaggerate their thinness. 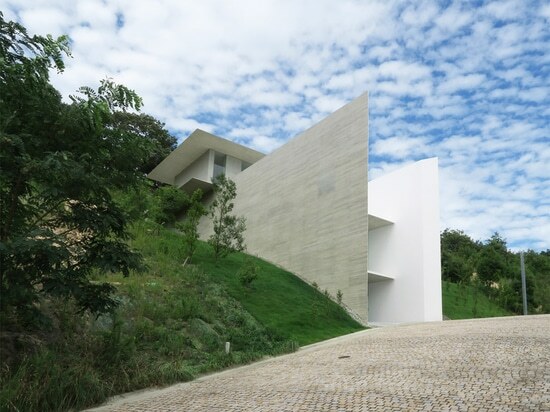 Grassy mounds flank the house to help integrate the sharp lines into the natural setting. 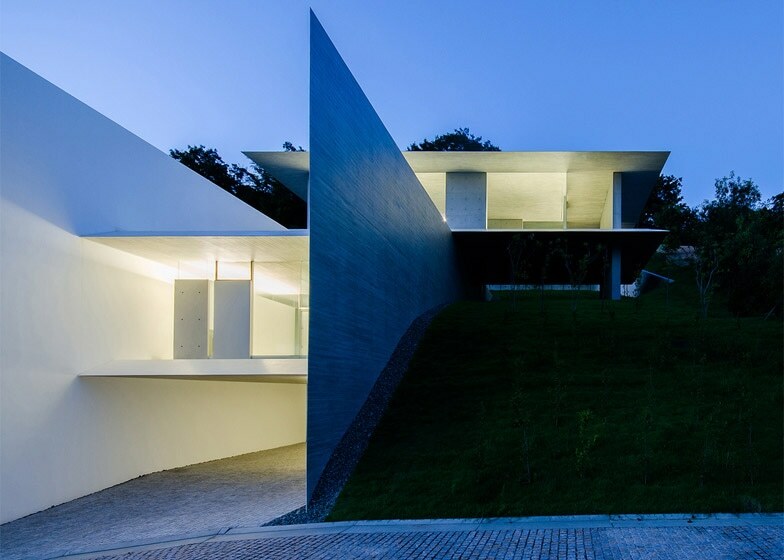 "Two vertical walls and four horizontal slabs are configured towards the slope and spaces for living are created between them," said the Japanese firm. "Each space is different in relation to nature," it added. "Furthermore, the boundary between nature and architecture, that is the edge of the slabs and the walls that define space, are scraped off." The inner faces of the slabs are painted white, while the board-marked concrete surfaces are left exposed on the outer faces. "As one side is bare concrete and the other side is all painted in white, materiality and massiveness is lost," explained the studio. 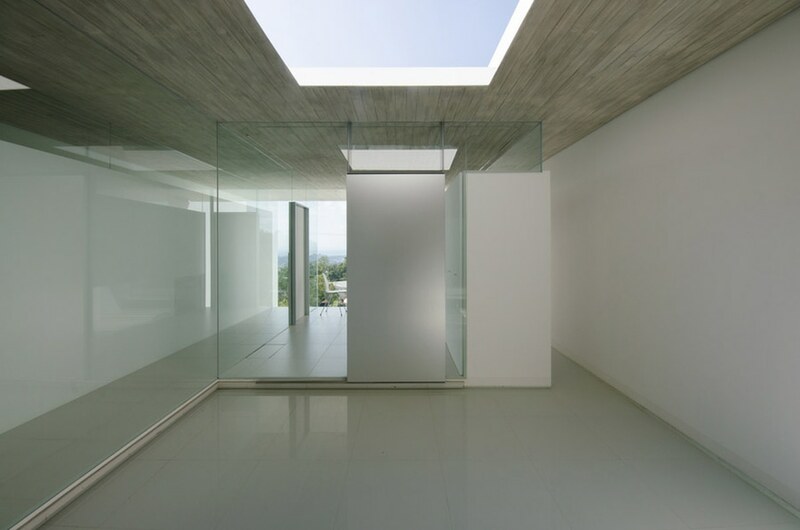 Large square skylights draw light into sections of the building that are partially encased in earth, while the glass facades naturally light rooms facing the valley. 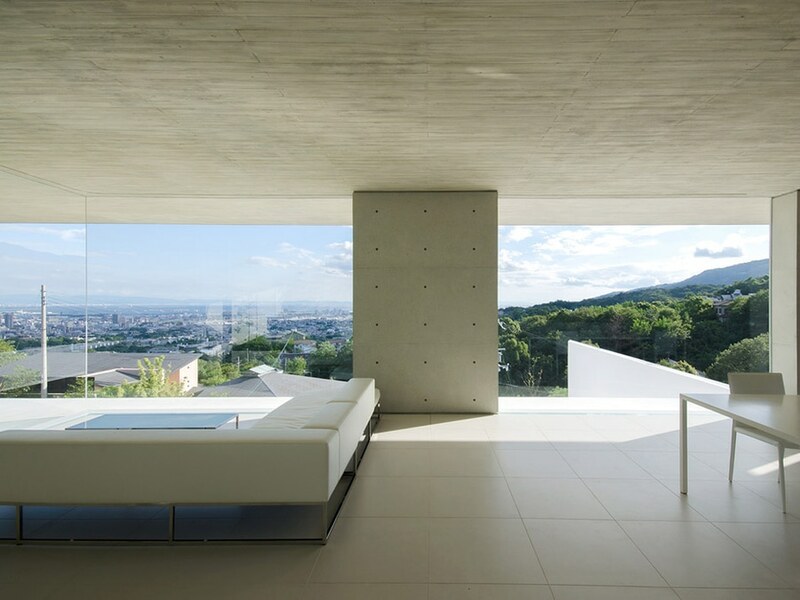 Inside, raw concrete walls and ceilings are paired with glossy floor tiles and white furnishings. Bedrooms, bathrooms and a traditional tatami room are spaced across the first and second floors, while a garage is placed between the two vertical concrete planes at ground level. 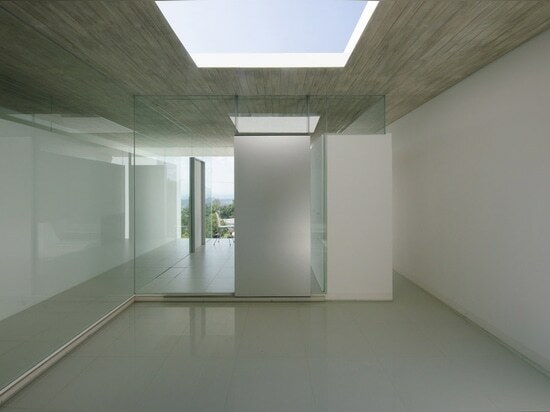 A glazed area below one of the square skylights is left open to the air and designated as a pool.